Can we agree that the best part of this episode was the haiku that Homer accidentally helped Lisa write? Because I loved it. The rest of the episode? notsomuch. Robots taking over has been a "thing" for as long as I've been alive. I remember two episodes where machines took control on Teenage Mutant Ninja Turtles alone! So, this was nothing new or innovative, and I found the non-robot scenes to be the funnier bits. The only other thing of note (in my opinion) was that Mr. Burns came to Springfield when Marge was a child... and if his age now includes four digits (isn't that conflicting with some information regarding his age from about 10-12 season ago? ), he was mighty old then, too... but he doesn't really look it. Not that cartoon characters age well, or that the characters on this particular show really age at all, but that's an entirely different issue. Homer's not the only one struggling to "stay clean," however. When Lenny finishes his drug test, he licks a toad, passing a guy huffing and another drinking the milk from a snake's fangs. [so is the bottomline that Springfield is so depressing that EVERYONE is trying to forget about their sad lives?] 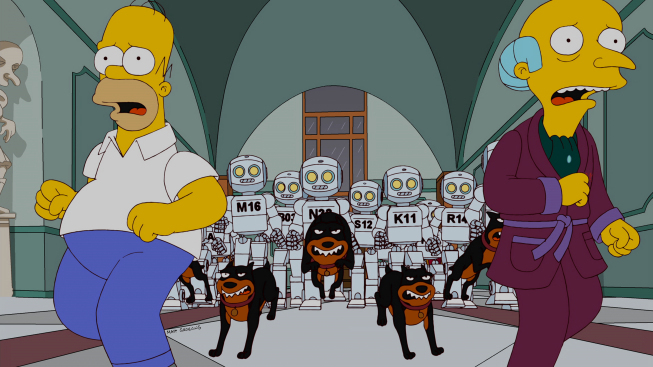 The tests are largely forgotten about, however, when Burns unveils worker-robots to take over the power plant. Smithers suggests that they keep one human to sign for packages and do things that would "waste a robot's time," so Burns lets Homer stay. [I know Mr. Burns is old and all, but can he never remember that Homer is just about the worst employee ever?] Smithers is also replaced, regardless of how hard her tries to be a robot. [haha] Homer heads in the next day and jokes with the robots, but they don't respond and eventually shock him. Homer is blamed for all user errors, and he's getting pretty bored. But, when he busts a robot and tries to fix it, he learns that the robots can be put into a "conversation" mode, yielding Homer a new BFF. [bets on how long this will last??] Homer learns that the robots can only move along yellow guidance lines, so he draws them out of the power plant and to a baseball field.